Enlargement of the uterus is not uncommon. Pregnancy and other benign medical conditions are the most common causes but in some cases, uterine cancer is involved. 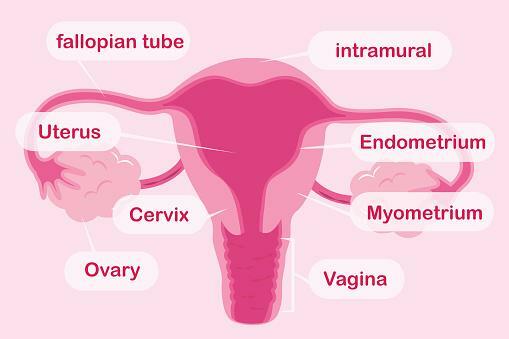 You may or may not have symptoms, but it is not difficult for doctors to detect that your uterus is bigger than normal. A normal uterus is about the size and the shape of a pear turned upside down. The National Uterine Fibroids Foundation notes the pelvic organ measures roughly 3 to 4 x 2.5 inches and weighs about six ounces. Unless affected by known conditions, uterine size remains constant from puberty to menopause and naturally shrinks after menopause. 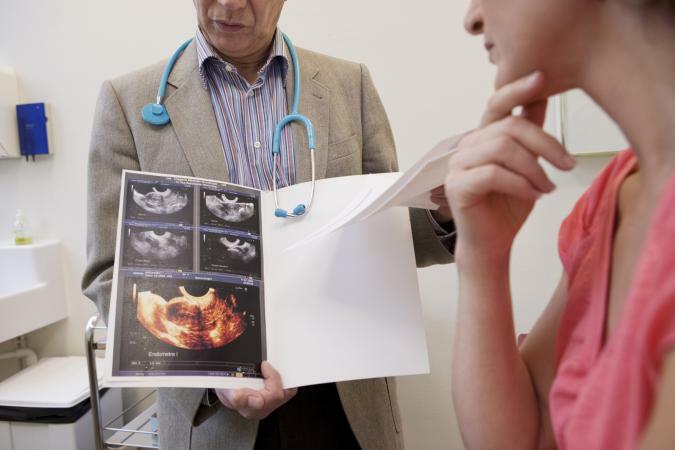 Doctors can feel changes in the normal dimensions and shape of your uterus during a pelvic exam, or they can be detected by pelvic ultrasound or other imaging studies. The following information describes the common conditions that cause the uterus to grow bigger. Note causes of uterine enlargement can make it difficult to conceive as well as interfere with a pregnancy. The uterus naturally enlarges through the stages of pregnancy. This is caused by the growing fetus and growth of the muscle wall of the uterus. A woman's postpartum changes include a rapid decrease in uterine size. The organ shrinks to about the size of a grapefruit shortly after delivery and typically reaches normal size about six weeks after the baby is born. Uterine fibroids can also make it more difficult to get pregnant. They can block the opening of the fallopian tubes and make it harder for egg or sperm to pass through. Fibroids inside the uterine cavity can also interfere with implantation of the early embryo. Adenomyosis is caused by growth of the inner uterine lining (the endometrium) into the myometrium, the middle muscular layer of the uterus. It is endometriosis inside the uterus rather than outside. Adenomyosis adds to the bulk of the uterus and interferes with its ability to contract. In addition to uterine enlargement and pain, women with adenomyosis can have heavy periods, menstrual clotting, cramps, and spotting between menses. Adenomyosis can also make it difficult to conceive but, thankfully, it remains in remission during pregnancy. Less often, hormonal disorders that disrupt ovulation and menstruation and make it hard to get pregnant might cause enlargement of the uterus. This can occur if the condition, such as polycystic ovarian syndrome (PCOS), causes prolonged production of estrogen from the ovaries in the absence of regular ovulation and progesterone production. Estrogen is considered a "growth hormone" for the uterus, and prolonged exposure can increase the growth of the myometrium and endometrium. If this happens, the uterus can revert to normal size once the underlying condition is treated. 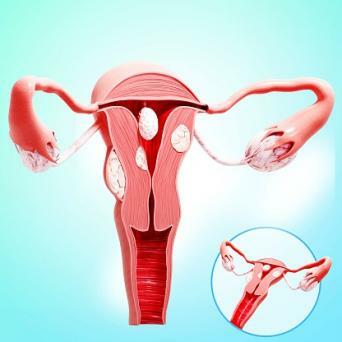 Enlargement of the uterus can also be caused by the growth of uterine cancer, which most often arises from the endometrium lining the cavity of the uterus. Endometrial cancer is more common in older women or those with persistent irregular periods such as women with PCOS. Other uterine cancers can arise in the myometrial wall or in a uterine fibroid. The most common presenting symptom in women with uterine cancer is abnormal vaginal bleeding. Pelvic or abdominal pain or pressure, bloating, and a frequent urge to urinate are some of the most common symptoms of an enlarged uterus. The bigger the uterus, the more severe these symptoms. Some women will require medical intervention, such as medicines or surgery, to treat the underlying cause. A woman can also experience other symptoms or signs, such as abnormal vaginal bleeding, depending on the cause of the uterine enlargement. Most women go to see their doctor because of symptoms and not because they know their uterus is enlarged. If your uterus grows out of your pelvic cavity, you might feel it if you happen to press on your belly. However, most often your bigger uterus is first detected by a doctor's exam. Consult your doctor for an evaluation if you are experiencing any pelvic symptoms or signs that your uterus is enlarged.